RESULTS: In all, 16 761 trees, shrubs and lianas with dbh ≥ 1 cm were censused, representing 71 families, 279 genera and 617 morphospecies. Floristic composition ranged from 94 to 132 species, with a mean of 117.5 species per hectare in lowland forest (50 m - 200 m) and 36-41 species, with a mean of 38.5 species per hectare in montane cloud forest (1600 m - 1778 m) near the summit of Mount Rata. 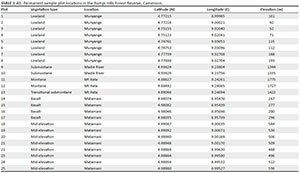 Two-way indicator species analysis classified the 25 plots into six vegetation types corresponding to lowland evergreen rainforest, lowland evergreen rainforest on basalt rocks, middle-elevation evergreen forest, submontane forest, transitional submontane forest and montane cloud forest. In all, 0.006% of the reserve was included in our sample plots. Detrended correspondence analysis highlighted the importance of elevation in shaping vegetation patterns. The Cameroon Mountains have been termed by different authors as the Mountains of the Cameroons (Durrell 1954), Biafran Forests and Highlands (Burgess et al. 2007; Cronin et al. 2014), Cameroon Line (Nono et al. 2004) or Cameroon Volcanic Line (Ayonghe et al., 1999; Marzoli et al., 2000). This chain of volcanic and plutonic isolated mountains covers 40 877 km2 (Sainge 2016) and is isolated by ~2000 km from the Albertine Rift and by 1500 km-2000 km from the highlands of Liberia and Guinea (Alweny, Nsengiyumva & Gatarabirwa 2014; Burgess et al. 2007). This region ranks high among the biodiversity hotspots in the upper and lower Guinea forest and is thus considered to be of global conservation importance (Barthlott et al. 2005; Marchese 2015; Myers et al. 2000; Onana 2013; White 1983). A few brief botanical collections were made in the Rumpi Hills area between 1976 and 1984, with a total of 57 botanical specimens collected by D. Dang, R. Letouzey, S. Polhill, B. Satabie and D. Thomas (National Herbarium of Cameroon database). It was not until 1996 that Thomas (1996) did a more intensive, rapid botanical survey of the area. Later, during 2000-2004, brief reconnaissance trips were made by D. Thomas, D. Kenfack and M. Sainge, during which 68 specimens were collected and deposited at the Missouri Botanical Garden Herbarium and the National Herbarium of Cameroon. The RHFR and surrounding areas are threatened by encroachment from both small farm estates and large-scale agro-industrial companies (Kupsch, Bobo & Waltert 2014). The Rumpi Hills Forest Reserve lies near the south-western extreme of the Cameroon Mountain range, in Ndian Division, South-West Region, Cameroon. It stretches across latitudes 4.6°N - 5.0°N and longitudes 8.8°E - 9.4°E, with an elevational range of 50 m - 1778 m. It covers an area of 458 km2 (Forestry Ordinance 51 1941). Data were collected in clusters of 1-ha sampling plots: southern plots (numbers 1-8) were located on level terrain at elevations of 50 m - 200 m; northern plots (numbers 18-25) on fairly level terrain at 400 m - 600 m; four plots (numbers 14-17) on basaltic rock at 250 m - 300 m; and eastern plots (numbers 9-13) on undulating terrain at 1200 m - 1778 m (Figure 1). The reserve per se is free from human settlements, as no villages are located within its core area. Twelve villages are within 1 km - 3 km of the reserve margins: Matamani in the northwest; Mata in the north; Madie and Dikome Balue in the east; Munyange and Nalende in the south; Mbange, Bossunga, Motindi and Lipenja Mukete in the west; and Meka and Besingi in the northwest. 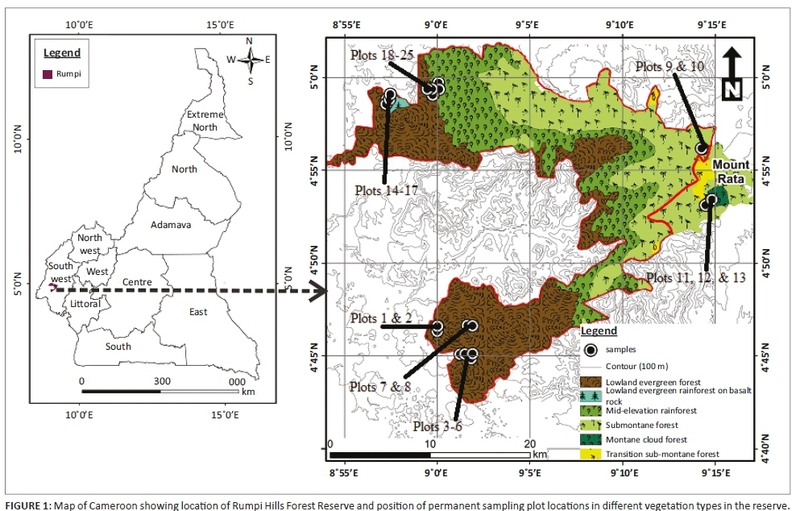 A reconnaissance survey based on topographic and vegetation maps of the reserve (Letouzey 1985) was carried out to identify homogeneous areas of putatively different vegetation types (Sainge & Cooper 2014). Data collection was done from February to June 2015, using 25 1-ha plots, which were placed based on accessibility to sample different vegetation types and elevations (Figure 1). Each plot measured 500 m long × 20 m wide and was subdivided into 25 quadrats of 20 m × 20 m. For each plot, global positioning system (GPS) coordinates were recorded for the four corners, including start and end points (Appendix 1), via careful, repeated measures to assure accuracy (coordinates of these permanent plots are available at http://hdl.handle.net/1808/25180). 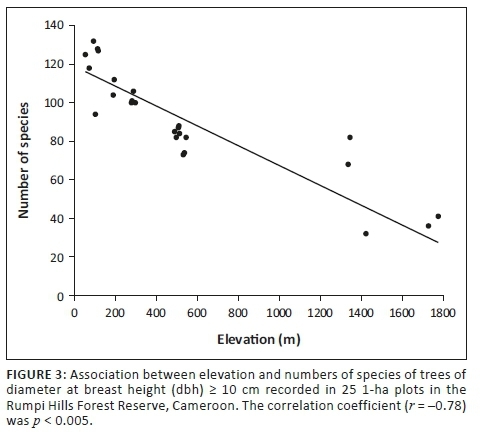 In each plot, all trees and lianas with diameter at breast height (dbh, 1.3 m above ground) of ≥ 10 cm were identified, measured with a diameter tape, tagged, recorded and mapped using their GPS coordinates. Smaller trees, shrubs and lianas (dbh < 10 cm) were sampled and measured with calipers in 10 m × 10 m quadrats located in every fifth 20 m × 20 m quadrat in each 1-ha plot. The forest was divided into four vertical strata: trees < 10 cm dbh as understory, 10 cm - 30 cm dbh as mid-canopy, 30 cm - 60 cm dbh as canopy and ≥ 60 cm dbh as emergent species. Finally, we recorded non-plot-based observational data (i.e. general plant collections) to detect and include species not present on the standardised plots. We recorded 4086 individual trees in lowland evergreen rainforest, 3600 in mid-elevation evergreen forest, 1831 in lowland evergreen rainforest on basalt rocks, 1191 in submontane forest, 1066 in montane cloud forest and 263 in transitional forest. 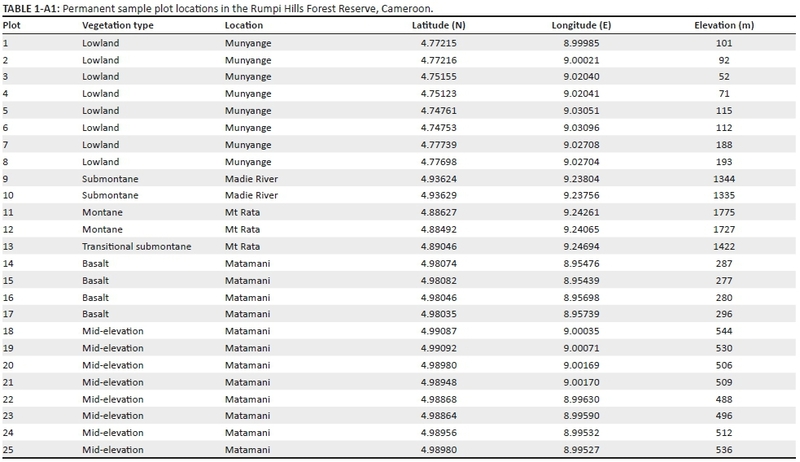 For all vascular plants ≥ 10 cm, the highest mean number of trees per hectare (596) was recorded in the submontane forest (range 542-649), whereas the lowest mean tree number (263) was obtained in the transitional submontane forest (Table 1). The mean number of shrubs per 0.05 ha varied as follows: 180 shrubs/0.05 ha in lowland evergreen rainforest (range 140-212) and 71/0.05 ha in montane cloud forest (59-83). The mean number of lianas ranged from no lianas in montane or transitional forest at dbh ≥ 10 cm to 6 lianas per hectare (range 0-12) in lowland evergreen rainforest (Table 2). Mean basal area ranged from 37.5 m2 ha-1 in lowland evergreen rainforest (range 28.4 m2 ha-1 - 44.2 m2 ha-1) to 34.4 m2 ha-1 in montane cloud forest (34.3 m2 ha-1 - 34.5 m2 ha-1) (Table 1), for trees ≥ 10 cm dbh. 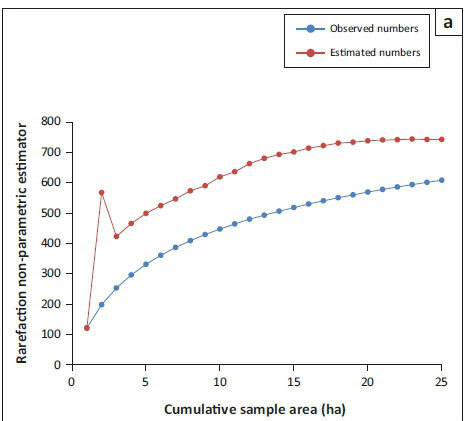 For shrubs < 10 cm dbh, mean basal areas were low, ranging from 0.27 m2 ha-1 in lowland evergreen rainforest (range 0.11 m2 ha-1 - 0.98 m2 ha-1) to 0.09 m2 ha-1 in montane cloud forest (0.06 m2 ha-1 - 0.12 m2 ha-1). 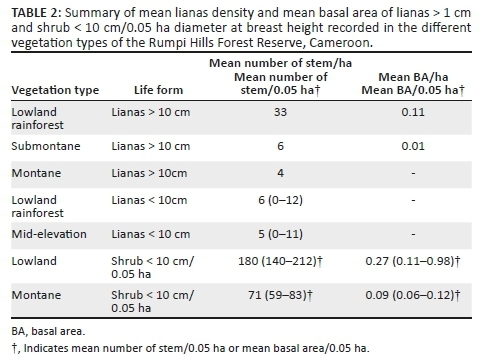 Lianas ≥ 10 cm dbh ranged from basal areas of 0.11 m2 ha-1 in lowland evergreen rainforest to 0.01 m2 ha-1 in submontane forest (Table 2). Lower-elevation vegetation types held many more species than high-elevation vegetation types. The linear multivariate model revealed a strong significant negative relationship between species richness and elevation (r = -0.783, p < 0.05; Figure 3), with numbers declining from 117.5 species (94-132 species) in lowland rainforest to 38.5 species (36-41 species) at high-elevation sites (Table 1). In all, 16 761 individuals of trees, shrubs and woody lianas were recorded in 25 1-ha plots across the RHFR. The 25 1-ha plots were classified in the TWINSPAN analysis into six groups at 50% similarity (Figure 4). Plots 1-8 corresponded to lowland evergreen forest (sensu Letouzey 1968, 1985), characterised by an abundance of Oubanguia alata (556 individual trees). Plots 14-17, grouped together, corresponded to lowland evergreen forest on basalt rocks that had abundant Crateranthus talbotii (103 individual trees). Plots 18-25 clustered together and can be termed mid-elevation forest, abundant in Strombosia grandifolia (324 individual trees) and Leonadoxa africana (192 individual trees). Plots 9-10 were in submontane forest abundant in Tabernaemontana ventricosa (102 individual trees), Cola verticilata (75 individual trees) and Dasylepis thomasii (68 individual trees). Plots 11-12 were in montane cloud forest abundant in Strombosia sp. (146 individual trees), Carapa oreophila (125 individuals) and Xylopia africana (121 individual trees). Lastly, Plot 13 was in transitional submontane forest rich in Macaranga sp. (56 individual trees), Trema orientalis (46 individual trees), Bridelia grandis (33 individual trees) and Pauridiantha viridiflora (31 individual trees). Our floristic dataset of 25 plots was also subjected to DCA analysis and plotted along Axes 1 and 2. Variation was expressed along Axis 1, with an eigenvalue of 0.772 and a gradient length of 4.183, which reflects high variation among vegetation types and species composition. Vegetation types 4, 5 and 6 (submontane, montane and transitional forest, respectively) separated toward the positive side of DCA Axis 1, whereas vegetation types 1, 2 and 3 (lowland, basalt and mid-elevation, respectively) separated toward the negative end (Figure 5). DCA Axis 2 showed a weaker eigenvalue of 0.478, with a gradient length of 2.389 (Table 3). Figure 5 shows patterns suggesting that vegetation types 1-3 are more closely related than vegetation types 4-6. 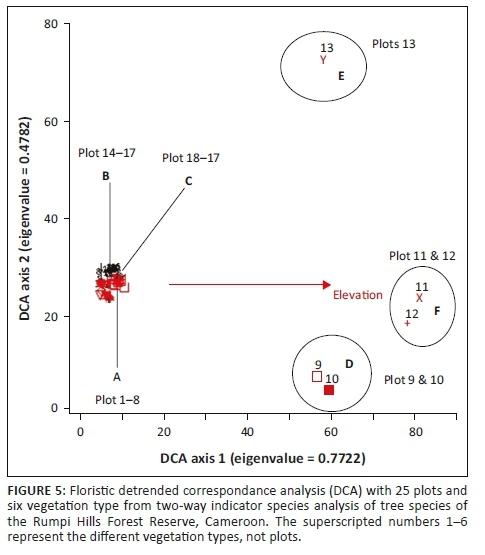 A high species-environment correlation for Axis 1 indicates a strong association between vegetation type and elevation, which can be verified from the biplot record (Figure 6). A Monte Carlo permutation test (998 runs) with an eigenvalue of Axis 1 and significant at p < 0.001 confirmed the strong relationship between species composition and elevation (Figure 6). Some emergent and upper canopy species were 30 m - 55 m tall, with huge buttresses that spanned 3 m - 10 m on the forest floor and trunk diameters of up to 2.5 m. Such tree species included Microberlinia bisulcata, Irvingia gabonensis, Desbordesia glaucescens, Pycnanthus angolensis, Saccoglottis gabonensis, Omphalocarpum elatum and Engomegoma gordonii. The canopy, 20 m - 35 m tall, was composed of tree species such as Tetraberlinia bifoliolata, Korupodendron songweanum, Santiria balsamifera, Eriocoelum macrocarpum and Pellegriniodendron diphyllum. This vegetation type occurs along the western edge of the RHFR, at elevations of 250 m - 300 m and dominated by Crateranthus talbotii (103 individuals, 5.6%), Trichilia prieureana (65 individuals, 3.5%) and Anthonotha macrophylla (64 individuals, 3.4%). This vegetation type is characterised by trees, shrubs and lianas with dbh < 22 cm and is made up of patches of huge basalt rocks. In all, 1831 trees with dbh ≥ 10 cm were recorded in this vegetation type, in 39 families, 122 genera and 175 species. Two tree species could not be identified to genus. Shrubs with dbh < 10 cm amounted to 40 families, 85 genera and 119 species. This forest type was characterised by a rich diversity of Fabaceae (234 individuals of 21 species), Rubiaceae (29 individuals of 11 species), Phyllanthaceae (98 individuals of 10 species) and Anacardiaceae (72 individuals of 10 species). This vegetation type occurs in the northern parts of the RHFR, at elevations of 300 m - 800 m, and is dominated by Strombosia grandifolia (324 individuals) and Leonadoxa africana (192 individuals). We sampled 3600 trees in 42 families, 119 genera and 176 species and 1153 shrubs in 41 families, 98 genera and 150 species. The most frequent shrub genera were Strombosia, Leonodoxa, Trichilia and Tabernaemontana; the most common species were Strombosia grandifolia, Oubanguia alata, Trichilia prieureana, Tabernaemontana brachyantha and Mammea africana. This forest type was found along the eastern edge of the RHFR, at 800 m - 1600 m elevation. It occurs close to the villages of Dikome Balue, Madie and Iyombo and along the western edge of the reserve around Mbange, Bossunga, Boa Yenge and Motindi villages. The Rumpi Hills Forest Reserve submontane forest occurs on steep cliffs and inaccessible slopes. We sampled 1191 trees of 38 families, 75 genera and 98 species; shrubs totalled 240 individuals in 32 families, 49 genera and 60 species. This forest type was rich in Rubiaceae (9 species), Euphorbiaceae (7 species) and Meliaceae (6 species) for trees; common species included Tabernaemontana ventricosa, Dasylepis thomasii, Cola verticillata, Diospyros cinnabarina and Garcinia conrauana. The submontane forest forms part of a mosaic of forest and grassland savanna above 1300 m - 1600 m.
The canopy here is relatively short (20 m - 25 m tall), with only a few tall trees, such as Cylicomorpha solmsii, Eriocoelum macrocarpum, Guarea cedrata and Sapium ellipticum, reaching 30 m - 35 m tall. Three species of large woody lianas were recorded: Dichapetalum heudelotii, Salacia pyriformis and an unidentified species. This vegetation type is a mosaic of forest and grassland occurring along the eastern edge of the RHFR at 1300 m - 1600 m, close to Dikome Balue, and is characterised by low diversity. We sampled 263 individual trees in 20 families, 31 genera and 32 species with dbh ≥ 10 cm and 61 individual trees in 16 families, 22 genera and 24 species with dbh < 10 cm. Dominant tree families with dbh ≥ 10 cm were Euphorbiaceae and Rubiaceae (4 species each); all other families were represented by only 1-2 tree species. Dominant genera were Macaranga, Trema, Pauridiantha, Bridelia and Margaritaria; most common species included Macaranga sp., Trema orientalis and Pauridiantha viridiflora. Rare species recorded here included Thunbergia affinis, Alangium chinense, Trichoscypha preussii, Monodora myristica and Uvariastrum pynaertii. Montane forest is found on the eastern edge of the RHFR, at elevations > 1600 m, up to the summit of Mount Rata (~1778 m). We sampled 1066 individual trees with dbh ≥ 10 cm, in 25 families, 38 genera and 48 species, and 146 individual trees with dbh < 10 cm, in 19 families, 24 genera and 31 species. This forest was characterised by species of Rubiaceae (6 species), Clusiaceae (5 species) and Salicaceae (4 species). Most abundant species included Strombosia sp. (146 individuals, 13.7%), Carapa oreophila (125 individuals, 11.7%), Xylopia africana (121 individuals, 11.4%) and Dasylepis thomasii (91 individuals, 8.5%). The upper canopy layer was 20 m - 25 m tall, with most species covered with numerous species of epiphytes (orchids, mosses, lichens, liverworts, bryophytes and Piperaceae). Understory vegetation was sparse. Woody lianas were scarce, with only two species recorded (Dichapetalum rudatisii and an unknown species). 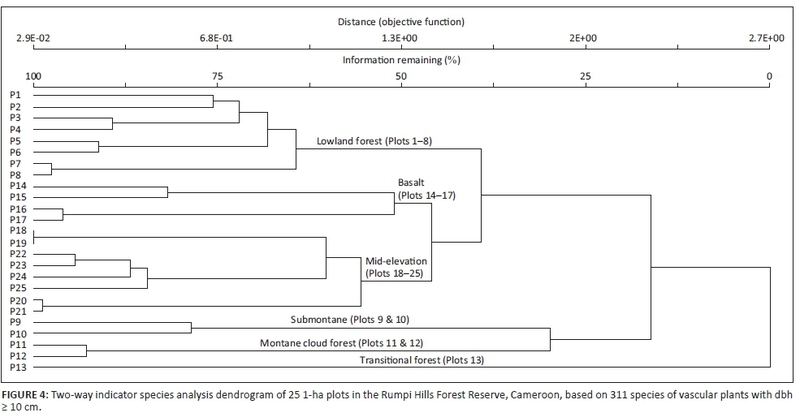 The RHFR is part of the chain of mountains of Cameroon and Nigeria that includes the Cameroon Mountains and associated highland biomes (Burgess et al. 2007; Cronin et al. 2014). It forms part of the Lower Guinea Forest, with high levels of species richness and endemism (Barthlott et al. 2005; Burgess et al. 2007; Plumptre et al. 2007). 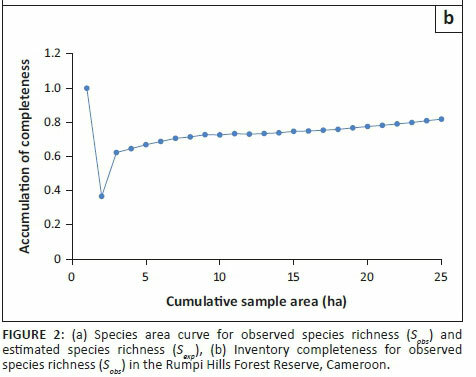 The occurrence of a mosaic of forest and grassland on the upper slopes of Mount Rata, at elevations of 1300 m - 1600 m, is not surprising, as grassland savanna begins at 1500 m in the Takamanda Forest Reserve, in the South-West Region of Cameroon (Sunderland et al. 2003), and above 2000 m on Mount Cameroon (Richards 1963). Administratively, Mount Rata falls outside of the RHFR and yet represents the highest peak in the Rumpi Hills range. Forest structure changed from lowland evergreen forest (50 m - 200 m), with some trees 35 m - 55 m tall, to montane cloud forest (1778 m), with a lower and more even canopy 20 m - 25 m tall, comprising trees with branches covered by Piperaceae, Orchidaceae, ferns, liverworts, lichens and so on. Our results agree with Letouzey (1985) that RHFR is composed of different vegetation types and show that these vegetation types demonstrate impressive variation in structure, species composition and distribution. Furthermore, RHFR contains a distinct montane vegetation type, as detected and defined by the TWINSPAN analysis, at elevations above 1600 m. This result concurs with Vallèrié (1971) and Thomas (1984), who both classified upper montane forest as starting from 1600 m in the Cameroon Mountains region. The effect of elevation on the vegetation of the RHFR was pronounced, as it influences vegetation pattern, vegetation structure, species diversity and species composition of the area (Figure 4) across an elevational range of 50 m - 1778 m. We documented marked changes in species composition with elevation: lowland evergreen rainforest on basalt and lowland evergreen rainforest rich in O. alata were relatively richer in species than the other vegetation types. The inverse relationship between species richness and elevation recorded in RHFR was consistent with results obtained in many studies (Chuyong et al. 2011; Hamilton 1975; Henrik et al. 2006). Dauby et al. 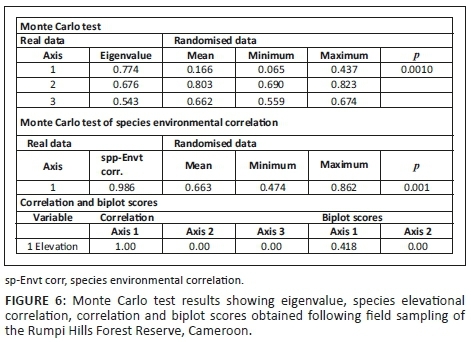 (2013) investigated tree diversity patterns in communities of evergreen forest trees in five landscapes of western Gabon and concluded that mean alpha and gamma diversities were much higher in the hilly region, with differences in elevation explaining a significant part of species turnover. Decreased alpha diversity with elevation within the hilly region could be associated with mass effects, which are expected to enrich valleys and slopes (Dauby et al. 2013). Overall, in RHFR lowland forest is characterised by large trees with huge buttresses and lianas; at high elevations, shrubs and tree branches are covered with bryophytes and vascular epiphytes and tree boles and leaves are covered by moss and liverworts, with a minimal liana population. Our detailed sampling across vegetation types and elevations within and near the RHFR makes our data useful both for ecological understanding and for guiding management decisions. Given that our plots are permanent, with GPS-based outlines of each sampling plot (http://hdl.handle.net/1808/25180), the opportunity arises to repeat these censuses in the future (e.g. every 5-10 years) to understand the dynamics of the forest (Condit 1998). Such detailed monitoring would allow a far more nuanced understanding of the status and condition of these forests, as well as of the effects of global change on their composition and structure. Onana, J.M., 2013, 'Environnement biophysique', in J.M. Onana (ed. ), Synopsis des espèces végétales, vasculaires endémiques et rares du Cameroun: Checkliste pour la conservation et la gestion durable de la biodiversité, Flore du Cameroun 40, pp. 6-23, Ministère de la Recherche Scientifique et de l'Innovation, Yaoundé [ Links ].